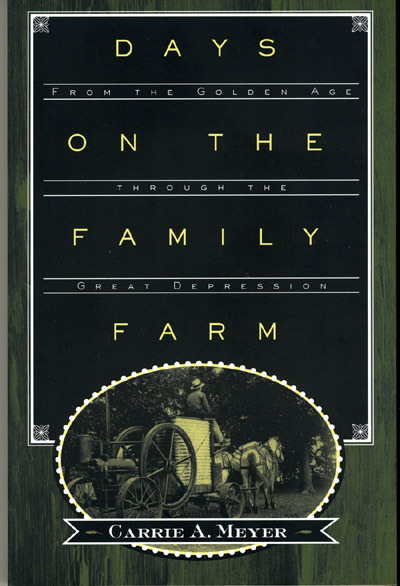 From cryptic entries such as these below, Days on the Family Farm was crafted. Check here for periodic updates or follow along at MayDavisDiary on Twitter. 4-1-1919 25o above at 7AM. Clear, still. Ground so frozen, Elmo not go to field till PM. Get up 3 loads chunks from “20” in AM. Carrie & Fred here at eve. 4-2-1919 Nice AM. Get cloudy in PM & rain a little about 4. Elmo finish dragging in wheat by school field. Not sow all piece as it so wet. Ground frozen in morn. Ed Pepper here for oats in morn. Mama call at McL in PM. 4-3-1919 44o above at 7AM. Misty morn. Sow wheat & wheat & oats mixed on field S of barn & pulverize. Boys dig me horseradish & parsnips. Mama to Gleaners at EMB’s with Mat Ralston’s. Clear up late in AM. Children home early as teacher not feeling well. 4-4-1919 Mama have headache. Elmo pulverize after sowing some oats. Partly cloudy & rain a trifle. 4-5-1919 Cloudy much of AM. Rain little enough to lay dust. Elmo sow oats & pulverize & drag. 4 Starr’s boys up with parsnips. Elmo go to McL for our drake. Both ducks gone & drake went over there. Annie go home about 5:30. Elmo & ma to R at eve in light thunder showers. I go to Kleckners. 4-6-1919 (Sunday) Elmo & I go to Durand in Ford. Nice day. Very warm. Look showery in late PM. Annie back at eve. Set clock ahead at night. 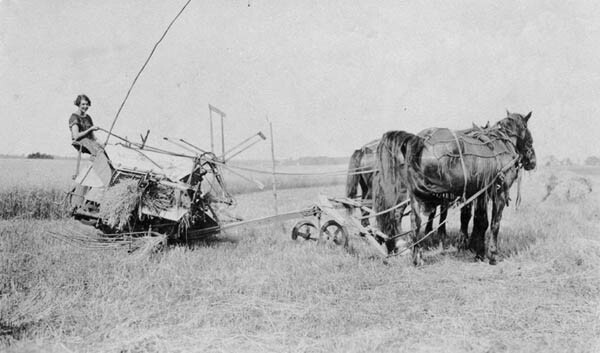 4-7-1919 Elmo pulverize & sow oats. Shower in morn early, but men work in fields right after easterly winds. Heavy shower at night, rain till 9PM about 2 hrs. Trifle of hail in morn. Letter from May P.
4-8-1919 Elmo clean oats for Mr Frigast & then go R with grist in Ford. Mama come home with him. Hilda Rutz work here as we expected paperers, they not come on acct of mud. Elmo pulverize & sow in PM. Letter from Kate. 4-9-1919 44o above at 9AM. E wind, cloudy. Rained quite a lot last night. Elmo work in oats. Mr & Mrs Molander & Starr & Maggie call on way home from Red Cross meeting at Lake’s. Annetta & Emily stop from school & here to supper. 42o above just before dark. Sent letters to Kate, Aunt Alice & Florence. 4-10-1919 Very windy from SW. Cloudy, so cold Elmo wear fur coat to pulverize. He not go out till 4PM. Uses 5 horses & puts drag behind pulverizer. Sows some in morning & then go R in Ford. Miss Roddan & mama go to Starr’s for the night. Elmo & Annie & I go down in eve. Rain some in PM & eve. Mud. 4-11-1919 40o above at 10AM. Joe bring mama back when he took Miss R & children to school. Cloudy. Letter from Aunt Agnes. Children have already found spring beauties. Elmo drag oats. 4-12-1919 46o above at 3PM. Cloudy. Letter to Aunt Agnes. Elmo & I go T in Ford. Elmo to meeting at Court House about cemetery. I to Fitch’s. Mable still in bed. Elmo put in small patch of barley S of barn in PM. Beulah, Dorothy & Merwin here in AM. Annie go home in PM. 4-13-1919 (Sunday) Nice day, sunny & somewhat warmer. Begin to cloud up in W in late PM. Elmo go to Carrie’s, CV and gravel pit in AM. In PM, he & I go to Howard’s, Frigast’s & Starr’s. In eve, Elmo to Picken’s. 4-14-1919 44o both AM & PM. E & NE & SE wind. Raining gently before 6AM. Rain harder much of AM & drizzle much of PM. Elmo do odd jobs. Rain hard in eve from E. Thunder & lighten. Letter from Puss. 4-15-1919 36o above at 7:30AM. 5 little pigs. Cold E wind. Rain off & on thru-out day. Elmo fix cellar stairs, shell bu seedcorn, etc. Franklin begin to do chores for me. Stay all night. Letters to May P, Puss & Uncle Aleck. Card to Mary W. Mr Frigast have operation at St Anthony. 4-16-1919 ChasK help Elmo take off pigs. Cloudy, cold, rain some. 4-17-1919 Sun come out quite early & a nice day. Elmo take oats to R. Split some wood when he get home. Mat R drive in on way hom from bring Mrs Frigast from R.
4-18-1919 White frost, last night froze ice and ground. Sunny & nice. Elmo take oats to R. When home (about 4:00) sow grass-seed. Franklin stay all night tonight. 9 little pigs. Mama call on Mrs McLarty. 4-19-1919 Warmer, sunny, windy, south. Franklin do chores & go home in AM with father when he up to McL for drag. Elmo work in grass seed in AM & sow barley in PM. Partly pulverize it. Cloudy PM. All go R in Ford at eve, ma stay down. Roads very rough. 4-20-1919 (Sunday) Clear, SE wind. Sun warm. Wind cool. Elmo & I drive to Clinton & to Bengston’s. Main roads good, but we find some very rough. Call at Pickens, only. Miss R there. 4-21-1919 Elmo finish barley & seed it to grass. Then he take oats to Mrs Frigast & get wash. Take Hilda home after supper & stop at Picken’s. Hilda here all day. Franklin do chores after school. Nice clear, still day. 4-22-1919 Adams & Reid paper kitchen in AM. Beulah here. Elmo go R to settle “Puss” case & mama come home with him in PM. Franklin do chores. Cloudy about ½ AM & then clear. 7 little pigs. 4-23-1919 Thundershowers early morn, then rain about ½ AM. Elmo cut seed potatoes & do odd jobs. Florin get last of hay bales in PM. Windy & get cooler towards eve. 7 more pigs. Frank do chores. 4-24-1919 Cold, windy, March-like, partly cloudy. Elmo plow for garden & potatoes. No he didn’t, he shelled corn & sawed wood at McL & pulled auto out of mud. Mama go to Red Cross at Mrs Brown’s with Maggie & Stanley. 4-25-1919 46o above at 4PM. Elmo & ma go R in AM. Cold, windy. In PM, Elmo fix potato ground for planting. Franklin start mow lawn. 4-26-1919 Froze ground last night. 54o above at 6PM. A nice day, tho sun set in cloud. Elmo plant potatoes in garden both early & late, & put in peas, radish, lettuce, & beet seeds. Telephone man fix telephone which has been out of order since Wed morn. 4-27-1919 (Sunday) Cloudy, chilly. Rain about last ½ of PM. Starr & Emily & boys up in truck in AM. In late PM we go to Carrie’s in Ford (Elmo & Fred go to CV.) Quite muddy when we come home. 4-28-1919 Clear & cool. 46o above at 7:30PM. Elmo go Belv in AM. Do odd jobs and then start to Frigasts’ with wash & find Mr Grow stuck in mud on way to fix stock pump. Then he go to McL with ma & fix bedroom door. Elmo take wash at eve. 4-29-1919 46o at 7AM. Partly cloudy, windy, SE. Begin to rain at supper-time. Elmo draw out 10 loads fertilizer. Franklin finish mowing lawn. Mr Frigast come home from hospital. 4-30-1919 Rained quite a bit last night. Letter from Puss, letter to Puss. Elmo work on creek pasture fence & let water out of steeryard. Take Hilda home, she sweep, dust, bake, etc. Elmo help CK ring pigs in morn. 3-1-1919 2o above at 6AM. Partly cloudy, still. Elmo go R in Ford. Roads quite icy. 3-2-1919 (Sunday) Nice day overhead. Thaw some. 3-3-1919 Letter from Puss. Book agent here. Beulah here to sweep, dust, scrub. Elmo take hay to R. Thaw more today. Roads muddy on top. 3-4-1919 Rain early in day, turn to snow, several inches fall before next morn. Beulah go to C. Kleckner in morn & back here by 4:30PM. Elmo take small grist to R in Ford in PM. Clarence say he can’t come regularly to do chores. 3-5-1919 Beulah clean kitchen. Elmo figure up income tax. Nice day. clear & still but cold. 10o above at 9AM. Thaw none. Mr McLarty trade off his balky horse for black one at CV. 3-6-1919 0o at 6AM. 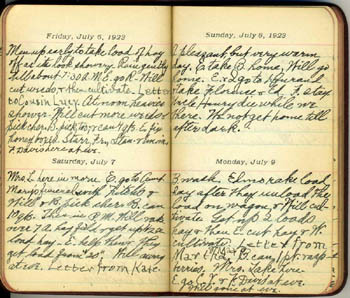 Elmo take Beulah home in morn & go R with Ford and to Freeport by train to shorthorn sale – bought “Victor.” Maggie Jane take mama to Mary J’s to Gleaners. Nice, still day, some cloudy. 3-7-1919 20o above at 6:30 AM. Letter from Carrie Davis and May Weaver. Send letters to Puss and Kate tomorrow. Irma & baby come out to their home. Nice day. Elmo do odd jobs. Mr Carlson here in PM to see about getting calves. Carrie and Fred move out to farm. 3-8-1919 Elmo go with H Carlson to R freight office for calves. McLarty baby arrive at 11PM. 3-9-1919 (Sunday) Nice day, thaw, so roads muddy, but not deep. Elmo & I take washing to Mrs Frigast & go down to see Carrie & Fred in Ford. 3-10-1919 Snow a trifle last night. Thawing early in morn. Partly cloudy, sometimes sun out warm. W wind blow up later in day, quite cool. Snow squall in PM. Elmo go to Brown’s in AM. Bed pigs etc & in PM draw pigs for EMB. Letter from May P.
3-11-1919 26o above at 7AM. Clear. Ground frozen hard. Mr Frigast go to Rockford hospital today. Rag peddler here. Fred Davis come for old pulverizer. Elmo take oats to R. Mama call on Mrs McLarty in AM. Elmo see bluebirds. 3-12-1919 36o above at 9AM. Frozen quite hard in morn, so Elmo got up load of firewood from “20.” Then he & mama go R in buggy. Roads deep with mud. Mama stay down at Aunt Alice’s. Beulah clean store-room. Fine sunny day. Letter from Kate. Blackbirds in our trees. 3-13-1919 Froze some last night. Cloudy, sprinkle a few drops wind NW. Beulah clean all upstairs. Elmo go to CV with small grist. Ed Pepper in in morn. Mr Holmes here in PM to write letter to Camp Grant Commander. No mail, so muddy. 3-14-1919 Letter from Puss. Cloudy, rain little early & nearly clear off before soon. Cloud up later. NE wind. Elmo draw up firewood from “20” & fix little card tables. Beulah clean back hall. Rain again in evening. 3-15-1919 Rain last night. Cloudy & warm & rain hard at times in PM from E. Lighten at eve & rain till after 12 at night, hard at times. Elmo go R in buggy & mama come home with him. Roads just deep mud & ruts. Beulah clean my closet, bureau drawers, & do up Sat work. I hear robin sing. Elmo has seen meadowlark. 3-16-1919 (Sunday) Warm, sun out nice in morn. Cloud over about 10AM & rain some before 12. Elmo take Beulah home in morn & me to McLarty’s. In PM, Joe & Walter here. Creek big in Brown’s & our fields. Elmo say no roads at all, so much mud. S breeze turn to N before noon, but not much colder. Let furnace fire go out & not start it till nearly noon it so warm. 3-17-1919 Rain begin about 5AM & keep up till abut 10:45. Then begin to snow. Some colder. Only snow a little. Clear off in PM & then at evening cloud come up in NW & rain a little. Mr McL help Elmo clean seed grain. 3-18-1919 34o above at 7AM. Frozen trifle last night. W breeze, clear. Elmo take a small grist to C Kleckner’s to get grist ground in AM. Elmo & I to CV in PM. Call at Carrie’s, Starr’s, & get washing from Mrs Frigast’s. Roads a fright for mud. Wash out by Seeley’s. 3-19-1919 Nice day. Elmo do odd jobs. Go to C. Pickens in PM. 3-20-1919 65o above at noon. A perfect day. Beulah here. Clean bedroom & wash windows on outside. Elmo go to R & to Nelson’s sale. At eve he & I go to party at E.M. Breckenridges. 3-21-1919 Cloud up last night & few flakes snow this morn. Starr & Stanley up for fanning mill. Beulah clean dining room. N wind & colder, but clear up early. Starr & Frank bring fanning mill back at suppertime. Elmo go R in PM to Mrs Geo Stevens funeral. Get 2 loads manure out in AM. Elmo & I go to Geo Brown’s at eve. 3-22-1919 31o above 7AM. Clear & still. E breeze. Elmo draw 5 loads manure. Beulah sweep, bake, etc. Call at McLarty’s in PM. Send letters to P.G. & Uncle A[lex]. Florence [Fitch] have operation. 3-23-1919 (Sunday) Nice day. Clear & still. 32o above at 7AM. Edwin Holmes here in AM & Kleckner’s children in PM. Mama write to Puss. 3-24-1919 34o at 7AM. Nice clear spring-like day. CK help Elmo draw pigs to Argyle to ship with Geo Brown’s. Mr Barklay here for grass seed. Eunice McLarty start school. Elmo get out 2 loads fertilizer. Picken boys here at eve. 3-25-1919 44o above at 7AM. Cloudy till nearly noon. Send letters to Kate, May, & Florence. Write to Aunt Augusta. Elmo draw manure, get 1 load from hen-house. Cloud up again in PM. Elmo plow in late PM. 3-27-1919 31o above at 7:30AM. Clear NW breeze. Elmo finish plowing for wheat & begin to pulverize. Ground pretty wet. Anna Falconer & baby call in PM. Mittimer & man come for straw. 3-28-1919 31o above at 7AM. White frost. Clear. Elmo pulverize. 3-29-1919 Elmo sow about 6A wheat, drag it & pulverize some more. Beulah & Dorothy here for horse-radish in PM & they & mama call at McLarty’s. Nice day, tho rather windy. 3-30-1919 (Sunday) Clocks changed last night. Elmo not change ours yet. Cloudy at last eve & rain a little about 9PM. Thunder once. Cloudy today & cooler. Elmo take washing to Frigast’s in PM & go on to Asa’s. Stop at Frank’s on way home. Starr, Annetta, Emily & Stan call in PM. 3-31-1919 N. wind. Ground frozen quite hard in morn. 30o at 6AM. CK come over & help dehorn cattle & then Elmo help him ring pigs. Then Elmo go R in Ford. Pulverize in PM. Ground pretty wet. Annie Molander come after school to help Clarence help do things in morn. 2-1-1919 Drag our roads. E. Wind. Clear most of day. J.W. Ralston come out for baled straw. Elmo, also, take straw to R. Starr & children up just before dark. Mr McLarty over in AM. Mrs McLarty & kids go to R & stay all night. Elmo & Starr go to see Dudley at hospital. 2-2-1919 (Sunday) – 33o above at 11AM. Partly cloudy, but groundhog saw shadow. SE wind. 2-3-1919 Sent letter to Puss. 36o above at 7:30 AM. Cloudy most of day & light showers in PM. Elmo take straw to R & grind grist at CK when he get home. Mrs McLarty & children here in PM. Bring over pups. 2-4-1919 10o above at 7:30AM. Clear & windy, NW. Elmo take baled timothy straw to town. Picken boys here at eve. 2-5-1919 11o above at 8:30AM. Elmo go CV in AM in auto. Roads rough, bring 2 wagon wheels home behind car. Clear. In PM, Elmo bed cattle, clean out ashes from cellar, get up load of wood from “20”, etc. Letter from Puss. 2-6-1919 10o above at 7:30. Snowed little last night & few flakes in AM, but sun soon out & fine day. Mama go to Brown’s with Maggie Jane & from there in auto to Jennie Breck to Gleaners. Elmo take hay to R. Roads pretty good. Annie Molander here all night to help. 2-7-1919 8o above at 7AM. Clear. Elmo go R with hay. Annie stay tonight also. Mr Dubois buried today. Elmo & I go to Taylor’s surprise at eve. Beautiful moonlight. 2-8-1919 Nice, still, clear. Annie go home in AM. Truck agent here in AM. Mama & Elmo go R in car about 11AM. Mrs McLarty & children here in PM. Howard & Irma here for evening. Roads good. Letter to Puss. Letter from May P.
2-9-1919 (Sunday) Nice clear day. Elmo take washing to Frigast’s. Many autos by here. 14o above at 8 o’clock. 2-10-1919 Fine day, clear, S wind, turn east at night. Elmo take pigs to Harlem. In PM, bed pigs & he & I go R in auto. Roads just smooth as summer. Beulah here. Mama at McLarty’s in PM. 2-11-1919 30o above at 7AM. Beulah go to CK’s right after breakfast. Elmo go R with hay. Cloudy early then clear & wind turn to SW. Mrs Brown call in PM. 52o above at 4:30 PM. Starr, Maggie & Stanley here before super. Beulah back about 4:30PM. 2-12-1919 Nice warm day. Elmo go R with hay. We all busy getting ready for party which we have at eve. All come & it rain a little before they leave, having gottten cloudy before dark. Letter from P.G. 2-13-1919 Rain hard at times thruout day. Dark. Fog thick in PM. We make about 7 qts mincemeat. Use up last of beef we got from Starr. Elmo take Beulah home before dark. D. Price have sale. 2-14-1919 Some rain & snow. Ground partly white. School social postponed. Elmo go R in buggy. Mama & I make 21 valentines for children. Get 2 apiece. Letter from Carrie. 2-15-1919 Elmo get washing from Frigast. Clear up during day. Bed cattle, make gate, do odd jobs. 2-16-1919 (Sunday) Home all day. Nice day, but colder. Ground frozen pretty hard. Annetta, Emily & Stanley come up with some mail that get in their box. Letter from Kate. They stay for dinner. Mama write to Kate. 2-17-1919 Letter to Carrie. Elmo take pigs to Harlem for Mr. Molander. Pile up wood at “20” ready to saw. Snowed last night enough to cover ground. Mostly thaw thru day. Clear. 2-18-1919 18o above at 7AM. Clear. Elmo take hay to R. Muttimer come for timothy straw in late PM. Telephone out of order today. 2-19-1919 Telephone all right today. 24o above 7AM. Little cloudy. Elmo help Mr Molander saw his wood at “20” & then saw our 3 loads down there. Dr Carlsen here in AM. I not feel well for some days. Mama go to McL in PM. Clarence here for supper as school social tonight. Letter from Uncle Aleck. 2-20-1919 Cloudy, chilly, SE wind. Children give glowing acc’ts of social. Made $51. Elmo take hay to R. Frozen so roads very rough. About 2:30 it began a regular blizzard. Not cold tho. Letters to Uncle Aleck & May P.
2-21-1919 Cloudy most of day. Elmo home in AM. Mama have cold. Norman H. Fitch born [to Howard & Irma] at 5:30 AM. Elmo go R with McLarty’s in auto in PM & drive new Ford home. Roads rough & snowy, but car go good. 2-22-1919 Florine come for hay. Begins to snow about 9:30AM. Snow gently a good share of day. Elmo take washing to Mrs Frigast & then go to Belv in Ford. Roads very rough to State Rd. 2-23-1919 (Sunday) Clear, still day. Not cold. Fred Davis come out in Ford in PM. Wrote to Puss, Mary Weaver, & Irma F.
2-24-1919 Partly cloudy, rather warm S wind. Snow thaw fast. Elmo go to C Picken’s in Ford in AM. Help Bengston’s load up to move tomorrow in PM. Write letter to Cousin Hattie. 2-25-1919 14o above at 7AM. NW wind, cold 18o above at 3:30 PM. Bengston’s move. Elmo go R with Ford on hearing of Clara Enoch’s death last night. Roads very rough. 2-26-1919 8o above at 6:30AM. Still. Cloud up after daylight & snow gently much of day. Sun out occasionally. Starr stop in in PM on way home from helping move Bengston. Elmo, taking C Pickens, goes to R in Ford where they take Interurban to Freeport (to account man’s court trial). Not home till about 9AM. Irving do night chores. 2-27-1919 Cloudy. E & NE wind. Elmo get washing from F. Florine come for hay in PM. 2-28-1919 36o above at 8AM. Cloudy & begin to rain before 9AM. About noon stop, then begin again from W (had been E) about 2PM & at 3 was snow & freezing. Regular blizzard at 4PM. Not much snow come down, but blew thru air so at times we can hardly see barn. 1-1-1919 Elmo take us to Starr’s in AM and then Edwin Molander help him take pigs to R. Elmo get back to Starr’s about 4PM. Cloudy till middle PM. Snowed last night enough to help sleighing. SW wind drift it some, and turn very cold in PM. 1-2-1919 0o at 7:30AM. Sunny. Elmo take hay to R. First go to woods with with Mr McLarty to show him where to get trees, then he help load hay, etc. Letter from Miss Pulver. Letter to Mrs VanDyke. 1-3-1919 12o below at 7AM. Little fine snow early, clear middle AM. Elmo open up silo. Take oats to R. Rob & Maggie take mama to Frank Reid’s to Gleaners. Maggie & children here in PM. Letters from Carrie & Puss. 1-4-1919 20o below at 7AM. Grow warmer toward eve. Cloudy. Elmo go R with oats. Geo & Willie here at eve. Mrs McLarty & children here in PM. 1-5-1919 (Sunday)18o above at 1PM. Partly cloudy. Snow gently at times thru day. Starr & boys, with 2 Taft boys, here in PM. I read “Red Pepper’s Patients” aloud. Use 2 eggs. 1st out of waterglass. 1-6-1919 15o above at 9PM. Letter to P.G. Clarence come to do chores after 3 wks absence on acc’t of sickness & vacation. School begins. Elmo go R with hay. 1-7-1919 28o at 8AM. Flurries of snow in PM. Sun out at times. Grow colder in PM. Elmo take hay to R.
1-8-1919 0 at 7AM. Cold SW wind. Sun out a little. Elmo grind grist for CK & himself at CK at AM. Take hay to R in PM. Wind drift snow in PM, but sun brighter. Mrs Brown & Mary J here in PM & we plan dinner for Sat. They give up going to Maggie J’s to Red Cross for snow drifts. Mrs Carlsen, CV Dr’s wife, died. 1-9-1919 14o above at 7AM. N wind, clear. Letter from Mary Weaver. Letter to Puss & Kate. Elmo home. EMB have auction of cows. 1-10-1919 18o above at 7AM. 31o at 4PM. Clear. Elmo take hay R.
1-11-1919 Fine day, quite warm in AM. Chilly in PM. We all go R, mama to Aunts, Elmo & I to J.G Ralston’s to thresher dinner. 1-12-1919 (Sunday) Thaw quite a little. Cloudy. 1-13-1919 Thaw so as to hurt sleighing some. Elmo take hay to R. Mrs Frigast here. Annie Molander come here after school. Beulah call in PM. 1-14-1919 Cooler. Partly cloudy. Elmo take hay to R.
1-15-1919 Very chilly SW wind. Elmo at CK’s in AM & both go to Mat’s for baler. Break axle by school house & leave there. In PM, Geo Brown help Elmo get it off & he take it to R.
1-16-1919 E & CK get hickory sticks from “20” and saw out piece for baler axle & several eveners. Grind feed, etc. Mrs McLarty & children here in PM. 1-17-1919 Warm & spring-like. Elmo take small load hay to R on sled. We (Elmo, Annie & I) go to Peter Ralston’s surprise at eve in bobs, take Kleckners & Hennings. 1-18-1919 Warm & springlike. Snow thaw fast. Elmo go CV with sled. Some use buggies. Emily & boys up with waists Clarence lost [stet]. Letter from May P.
1-19-1919 (Sunday) White frost in morn. Get pretty warm & thaw much. E breeze. 1-20-1919 White frost & fog. Ground frozen some. Elmo go R in buggy & mama come home. Letter to May Purdy. Frost & fog not go away till late PM. Then nice & clear. 1-21-1919 Some foggy. Frozen very little last night. Letter from Martha Kernan. Annie Molander go home from school tonight. Got baler from school and new axle from F. Reid. CK help get it. 1-22-1919 Elmo went Thad Davis’ sale. Starr bring Maggie & Stanley up before he go to sale & Red Cross meet here in PM. Dark, cloudy day. Very muddy. Beulah help all day. 1-23-1919 Nice day, little cooler, ground frozen little in morn. Ther 34o in morning. Same at eve. Elmo take Beulah to CK’s & go on to R. Home at 12. Get ready for balers in PM & shut up cattle to feed. Letter from Kate. 1-24-1919 Beulah came in morn. Bale timothy straw & some oat straw. Froze some last night. Fred Davis walked out from town last eve. Cloudy, east wind. 1-25-1919 Finish baling straw & hay. Franklin, Russell, Stanley & Emily come up with drake. Froze last night. Fine, spring-like day. Elmo take Fred to R at eve. 1-26-1919 (Sunday) Beautiful day over head. Roads muddy. Elmo take Beulah home in morn & then stop at CK’s. Go to McLarty’s at eve. 1-27-1919 Above 4o in PM. Very muddy. Elmo help CK draw pigs to Harlem. Mama walk over to McLarty’s in PM. 1-28-1919 26o at 7:30 AM. W wind. Clear. Thaw in sun. Elmo go R in buggy. F. Reid come for engine and baler in morning. Mama at McLarty’s in AM as men gone & Mrs McL think chimney afire! All safe. 1-29-1919 40o above at noon, clear & still. Elmo take straw to R. Roads very rough. Froze quite hard last night. Letters to Aunt Alice, Kate & Miss Pulver. 1-30-1919 30o at 8AM. Clear, still. Elmo bale straw at F. Reid’s. 1-31-1919 26o above at 7:30AM. Elmo bale till 2 PM at Reid’s then go to Rockford in buggy. At eve we all go to Bengston’s surprise. Roads frightfully rough. A beautiful day.